Saturday night was different from most. Eden and her husband Mike asked Heather and I out for dinner (which wasn't so unusual) and then to a belly dancing event called Rak 'n' Roll (which is unusual). The idea is to have belly dancers performing to rock, and there was a wide spectrum of styles from Scandinavian operatic heavy metal, to surfing music, to the Beatles, to some really rocking tunes I have never heard before. The women performing were wide ranging too from perfect bodies with stylish tattoos, to more mature women with bodies that had gone through a bit of living. All of them were graceful, all of them were lovely. The tattoos were an endless source of fascination for me. The first performer, had a moth that covered her back and spanned one shoulder blade to the other. It was stunning and her performance was wonderful to watch. Almost all the other women had tattoos of various sorts, made me think whether it would be something I would do...I'll keep thinking for now. I am happy, if not ecstatic to announce that I have finally overcome the brioche stitch. I don't recall if I wrote about this before, but I became completely befuddled by this seemingly simple stitch (YO, Sl 1, K2tog). I picked up some Camel yarn during the TTC Knit-a-long, and was confident I would be able to to do this neck gaiter (or warmer) that I saw in Interweave magazine. Well, the yarn over bit got the best of me and after numerous attempts in November, I gave it up. Knowing that sometimes it takes me a while to 'get' something like this, I picked it up again last week, ripped it back one more time, and then finally had success. I have over 4 inches on the circular needle (4 mm, with 130 stitches) and hope once this is finished I will have enough enthusiasm left to knit it in rabbit (picked up at the same time as the camel). Once the rhythm of this stitch is picked up, it has a lovely meditative quality to it that is different from regular knitting. I have one or two stitches that are out of sorts, but they are easily hidden by wearing the funny stitches on the inside (the actually disappear). Remember last August we had that horrible heat wave? 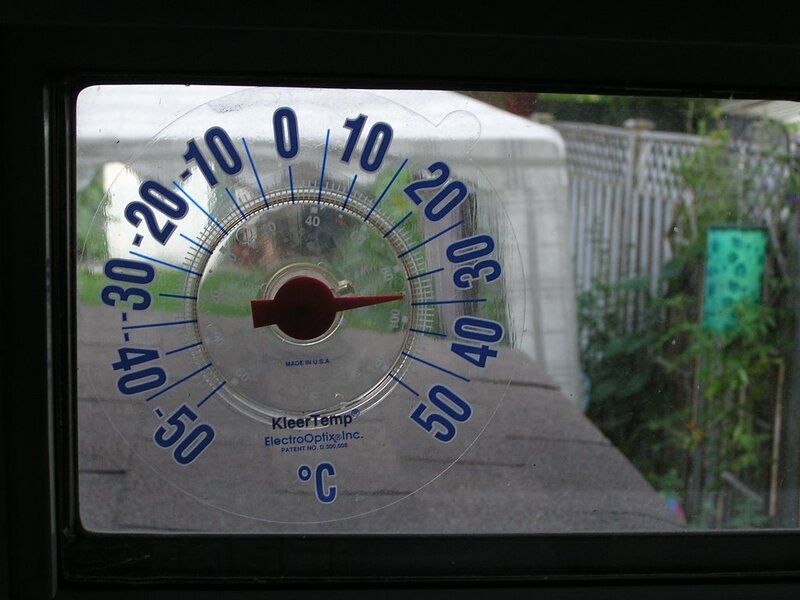 Specifically, August 1st I took a picture of our thermometre at 33 degrees Celsius. Well, it is 6 months later and we are in the depth of winter. It came a bit late this year (I don't think we had any snow until January 15th), but it is certainly here now. I don't have a picture of the thermometre, but the little weather icon on our desktop says it is -16 degrees Celsius and it feels like -28. That is a 49 degree difference in temperature from August (hate to think what the difference would be between the humidex then, and the wind chill now). As it is so cold right now, Heather is struggling to keep warm in the house (we do keep it no higher than 20 degrees). She has also discovered the warmth of wool (don't know why she won't listen to me) and as such, I have returned the cashmere yarn I spoke of last week, and I am on the verge of getting new yarn for a top down sweater. I have never knitted top down, and it will be very interesting to see how this works out, and will knit it in Lamb's Pride worsted weight which I have never used before. From returning the yarn in my stash that I had no idea what to do with, I should have no problem paying for this yarn that I do know what to do with. Lesson learned. posted by shyknitter @ 8:18 p.m.